In reality, there are many factors to how much water you should drink, and one size doesn’t necessarily fit all. Activity level, weight, health conditions, and climate temperatures are all variables in the water equation. In general, you can tell if you’re drinking enough water if you feel well and have stable energy levels, your urine is pale yellow or clear, you’re not constipated, and you have no symptoms of dehydration. If you have mood swings, energy slumps, dizziness, aches and pains, dry, dull skin that’s lost its elasticity, or dark urine, you probably need to drink more. Dehydration can lead to low metabolism, overeating, urinary tract infections, kidney stones, heat stroke, low blood volume, kidney failure, blood clots, fainting, seizures, and even coma and death. As we head into those hot summer days, here are some tips to ensure you drink enough water and avoid dehydration symptoms and complications. Tip #1 for Staying Hydrated: Carry a water bottle with you. Keep a water bottle with you all day every day. There’s nothing worse than being stuck in sweltering heat, feeling parched, with no water in sight! But plastic water bottles (whether reusable or disposable) leach BPA and other harmful chemicals into your water when heated — like when the bottles are left in your hot car for a couple of hours while you’re out running errands. 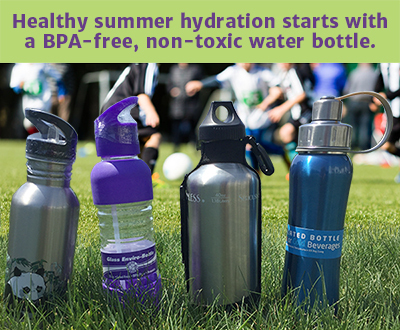 Nourishing World has a great selection of non-plastic, BPA-free water bottles. The New Wave Enviro Glass Water Bottles and Stainless Steel Flip N’ Sip Designer Water Bottles are great for everyday use. If you know you’ll be getting really sweaty at the gym or outdoors, bring the 40oz Seriously Safe Stainless Steel Water Bottle so you don’t run out too quickly. The mouths of these water bottles are wide enough to easily fit ice cubes to keep your beverage cool and refreshing. If you really want to keep your drink at the perfect hot or cold temperature, our Double Wall Insulated Water Bottles keep beverages hot or cold for more than 7 hours. Tip #2 for Staying Hydrated: Make it taste great! Cucumber and Mint: great for bloating! Tip #3 for Staying Hydrated: Restore electrolyte balance. Mix up an all natural electrolyte drink or sports drink. This can not only combat dehydration, but also keep your energy up and prevent muscles from becoming sore after exercise. To a 2 quart jar of water, add the juice of 1 lemon, 1/2 tsp sea salt, 2 capfuls of Life Minerals, and a packet of Natural Calm. Feel free to adjust the proportions a bit to suit your needs or add fruit slices to amp up the taste. Tip #4 for Staying Hydrated: Change it up. Water is best, but if you struggle to drink substantial amounts, hot or iced tea, coffee, fresh-squeezed juices, homemade lemonade, nut milk or cow’s milk, seltzer, and smoothies all keep you hydrated and can be part of a healthy diet. Tip #5 for Staying Hydrated: Eat your water! Fruits and vegetables such as oranges, melon, cucumber, celery, tomatoes, and lettuce have high water content that can help you meet your hydration goals without having to down quite so many glasses of liquids. Soups, broths, yogurt, ice cream, fruit popsicles, and homemade gelatin are also high in water content. Great article! Thanks for posting! You can also stay hydrated and balance your gut at the same time with fermented drinks such as kefir, kombucha, homemade ginger ale and many others. These are great tips as well, thank you for sharing!